As 2016 winds to a close, your County Board continues to be busy. 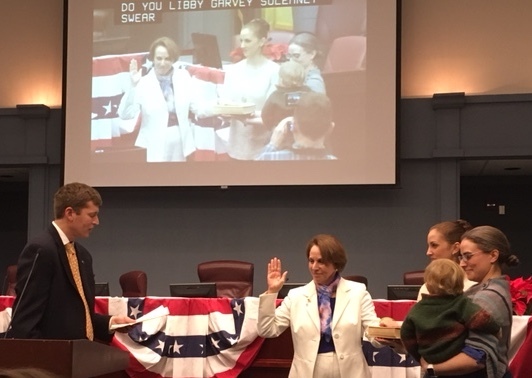 Last Tuesday, I had the honor of being sworn-in for my second full term on the Arlington County Board. It was a wonderful ceremony, featuring an original poem by Arlington’s Poet Laureate, Katherine Young, and food from three local, small businesses. Thank you to everyone who was able to join; it meant so much to me to see you in the audience. If you couldn’t join, you can watch a recording of the ceremony or read a transcript of my remarks online. On the 10th, we approved regulations to allow for short-term home rentals such as those arranged through online services like Airbnb and Craigslist. While many Arlingtonians have been hosting visitors through these services for a while, they were not permitted under Arlington zoning ordinance and our new regulations provide a framework for making this activity legal and consistent with the character of our neighborhoods. The new ordinance allows homeowners to rent out their primary residence only (we’ll likely add a provision to allow renters to share their primary homes next month), for no more than 185 days per year, and subject to common sense safety provisions like having smoke detectors and fire extinguishers. Owners wishing to participate will have to file a form with the Zoning Office. There will be no cost to file, although one will likely be added in mid-2017 to cover administrative expenses. These new regulations are an initial response to new economic realities, and I am pleased we are creating more flexibility for our residents to participate in the sharing economy. The most challenging issue this month was amending Arlington’s regulations for trespass towing of vehicles from private lots. Your Board weighed how best to balance the interests of businesses and property owners to use their lots with a strong desire to protect consumers from having their cars towed for technical infractions that do not violate the spirit of parking restrictions, such as stopping at a nearby ATM to get cash to spend in the business where they parked, or visiting two adjacent businesses quickly without having to move their cars. After two hours of debate, considering testimony and letters from businesses and residents, I believe that we still have not found the ideal solution but I hope we have found a path forward. The Board passed an amendment that will require tow truck drivers to receive a specific authorization from someone at the property for any tow, but we delayed its implementation until July. Most businesses and the towing industry fought this provision, while some speakers argued that it is a way to stop unreasonable towing. The amendment we approved was not anyone’s desired outcome, but we were not able to arrive at a better solution during this month’s meeting. So, I moved the new requirement with the six month delay. I am hopeful it will be an impetus for all sides to come together to find a better alternative that the Board can enact before this regulation goes into effect. These meetings bring our 2016 County Board agenda to a close. Thank you for your support throughout this year. Your active participation in government helps us all to stay connected and is vital to realizing Arlington’s full potential. I look forward to seeing you at our 2017 Organizational Meeting at 6:00 PM on Tuesday, January 3rd. Until then, have a happy, safe, peaceful, and joyous holiday season full of family, friends, and good cheer.